While truck accidents only account for a small percentage of the total accidents in Arizona, when these accidents do occur, they can be devastating for victims and families. Because of the heavyweights that trucks carry, when these accidents take place, victims are more likely to suffer more serious life-altering injuries. In 2012, according to the National Highway Traffic Safety Administration, over 100,000 people were injured in large truck accidents, and almost 4,000 people were killed as a result of these accidents. Unfortunately, statistics show that large trucks are more likely to be involved in multiple-vehicle fatalities than single-vehicle crashes. This means that when drivers make mistakes, more people get injured or killed, and more cars are involved. 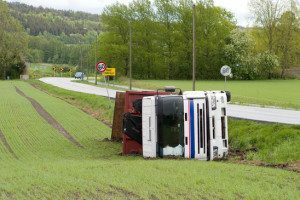 This is when a truck accident lawyer can prove useful. Truck accident attorneys are familiar with the complexities caused by injuries in truck accidents. Truck accident lawyers also know the worth of injuries caused in these serious accidents and a qualified car accident lawyer can get a handsome compensation. Truck companies are required to hold higher levels of insurance due to the increased risk they pose to other drivers on the road. Many companies and operators are required to hold insurance up to $1 million to protect victims. Injury litigation is different than car accident litigation because it often involves litigation against truck companies, operators, and insurance providers. Companies want to protect their bottom lines and many will hire tough defense attorneys. This means that victims of accidents often face an uphill battle when it comes to receiving compensation following an accident. When a company is at fault for an accident, lawyers will often try to mount a tough defense to reduce the company’s liability. This is why it is important for victims of collisions to find a skilled accident attorney in Mesa, Arizona. Raymond Arenofsky, Attorney at Law has 50 years of experience defending clients best interests and making strong cases to ensure that clients receive the maximum compensation allowable under the law. If you’ve suffered an injury, are experiencing pain and suffering, or missed time at work due to an incident, you need Raymond Arenofsky, Attorney at Law. He is one of the best truck accident lawyers in Arizona. He can represent clients in Mesa, AZ, as well as Phoenix, AZ as well as all over Arizona. Call his office at (480) 345-0444. Studies have also found that when trucks carry heavier loads, the chances for fatal accidents also increases. In order to protect drivers on the road, the Federal Motor Carrier Safety Administration sets clear guidelines for trucks and carriers. These rules and regulations limit the amount of time a driver can be on the road without rest and puts limits on the kind of loads trucks can carry. Furthermore, individual states have laws regulating trucks. Arizona has unique load limits it places on commercial vehicles. While Arizona generally allows commercial trucks to operate on holidays and weekends, there are some restrictions for overweight loads, meaning that these loads cannot be transported at certain times. Additionally, large loads may require pilot cars and special signage. While truck drivers are generally hard-working individuals who make sure that our goods get shipped to stores on time, companies and operators sometimes place great pressure on drivers to ship items quickly. This can result in drivers who speed, or who do not take the legal breaks required by law. Many drivers are paid cents by the mile, and are not paid for time they are resting or stopped at a rest stop. Unfortunately, many drivers will elect to not rest, posing a hazard to other drivers on the road. Furthermore, operators and carriers are required to ensure that their equipment is in good working order. Tire blow-outs and other problems with gear can result in tragic accidents on the road. Companies are required to perform proper maintenance work on vehicles. Unfortunately, some companies place the bottom line over driver safety. In this case, the companies can be held liable for negligence, including punitive damages. Punitive damages are meant to punish drivers for their failure to take proper precautions. If you’ve been injured in a truck accident, you need a truck accident attorney in Mesa, Arizona who can review the details leading up to your accident. Your attorney may need to investigate the case further, by determining the kinds of loads carried, and the state of the driver when the incident took place. Depending on the circumstances, you may be entitled to receive compensation for pain and suffering, medical expenses, lost wages, and even seek punitive damages. Raymond Arenofsky, Attorney at Law has the experience to review all details of your case and ensure that you and your loved ones receive justice. He is an experienced truck accident attorney based in Arizona, serving Mesa, AZ, and Phoenix, AZ. Call his office at (480) 345-0444. Raymond Arenofsky, Attorney at Law understands that the time following an accident is difficult for everyone involved. This is why you need a compassionate incident attorney who will provide you the personal attention you and your family deserve. Mr. Arenofsky has 50 years of experience protecting families and fighting companies aggressively to ensure that victims see justice served after a truck accident. If you’ve been in a truck accident in Mesa, AZ or Phoenix, AZ, you need Raymond Arenofsky, Attorney at Law. Contact us today for a free, consultation at (480) 345-0444.